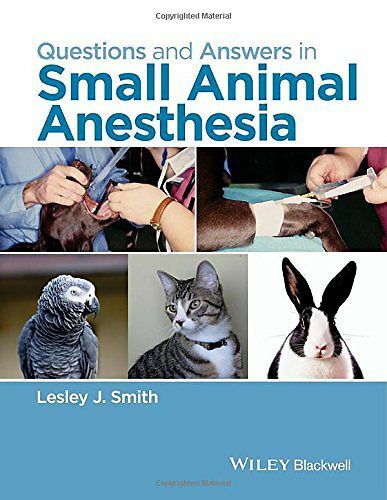 Questions and Answers in Small Animal Anesthesia provides practical and logical guidance for a wide range of anesthesia questions commonly faced in veterinary medicine. Expert authors offer insight into their clinical decision-making process in a highly readable format. Designed to supply specific answers, this succinct yet complete book is equally useful for troubleshooting problems encountered in anesthesia and learning best practices for anesthetizing dogs, cats, small mammals, and birds. Chapters cover all stages of the anesthetic process, from patient evaluation and preparation, equipment checks, premedication, induction, and anesthetic maintenance to monitoring and troubleshooting common complications, recovery, pain assessment and management, with chapters on specific disease conditions, breed considerations in dogs, feline-specific information, and anesthesia for small pocket pets and birds. Each chapter poses practical questions related to the topic and gives a concise answer for each one. Questions and Answers in Small Animal Anesthesia supports veterinary students and practitioners in making clinical decisions related to anesthetic management and improving patient outcomes.